It's time for dinner. It's been a busy day, and you didn't prep anything ahead of time. Should you just give in and order out? No! Don't do it! You have tons of options for quick delicious meals! 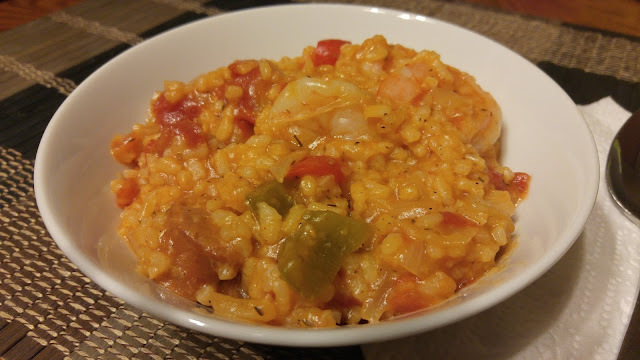 How about Jambalaya? What? You think that takes too long? Can Jambalaya be done fast? Say, in under an hour? And still be darn delicious? You bet. So don't order out. We don't have to resort to that yet. We don't have to pull out the instant mac or can of tomato soup either. How about a big bowl of spicy, homemade Jambalaya instead? Heat oil in large pot; saute onion, pepper, garlic, and sausage until onion is translucent. Add broth, water, paste, hot sauce, and chopped tomatoes. Bring to a boil, cover, and reduce heat. Simmer for 20 minutes. Add shrimp and cook until pink. Discard the bay leaf. Super quick! Most of your time is chopping a couple vegetables and adding seasonings. After everything is added, you can just walk away for those 20 minutes. Put a load of dishes in if you need to (you won't be dirtying many with this recipe).